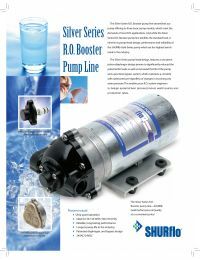 The Silver Series RO Booster Pump offers quality and reliability. The Silver Series is one piece, piston-diaphragm design which substantially increased the life of the pump and reduces the potential leaks. The precision bypass maintains a constant, safe pressure regardless of the changes in incoming city water pressure. This enables your RO system engineer to design systems with precise product water quality and production rates. 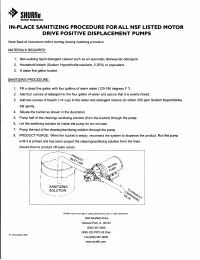 This booster pump is designed for operation with a Tank Pressure Switch, which monitors the water pressure in the RO unit's storage tank, and turns the pump on or off in response to the storage tank pressure. A Low Pressure Shut-Off Switch may also be installed, which will ensure the pump is shut off if the feed water is interrupted. Also, a Power Supply/Transformer is required for use with your booster pump. Power Supply/Transformer (required): The SHURflo 60-044-00 Power Supply/Transformer plugs into a standard wall outlet and converts to the voltage (24v) required by the pump. Tank Pressure Switch: Turns the pump on or off in response to the storage tank pressure. The SHURflo Tank Pressure Switches have wire harnesses, and either 1/4" QC Fittings or 1/4" FPT. 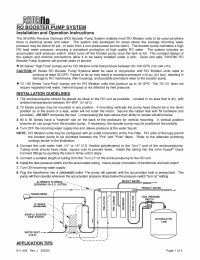 Low Pressure Shut-Off Switch: The SHURflo 94-080-01 Low Pressure Switch ensures the pump is shut off if the feed water is interrupted.